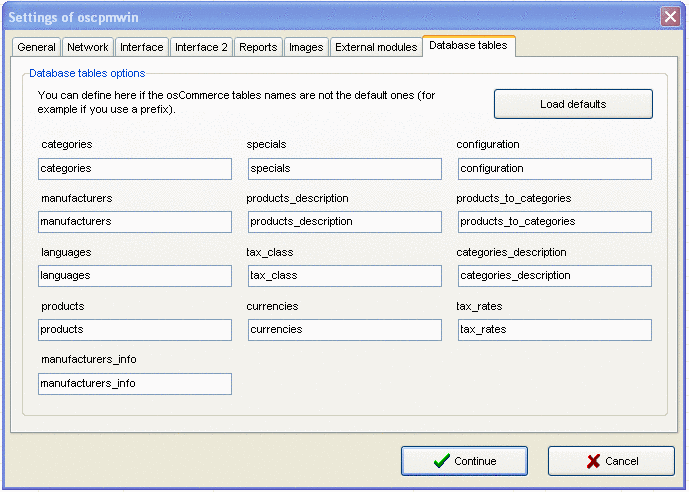 Configuration of the osCommerce Product Manager for Windows (oscpmwin). These are the options you can modify when viewing the Configuration dialog window. The options marked with * are required or the application will not work. If you are in a hurry, at least configure those marked options. 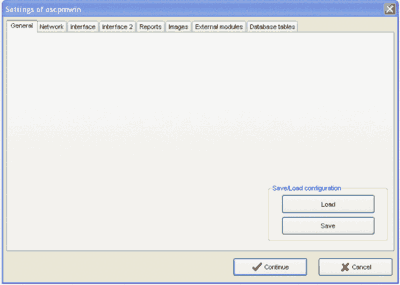 Load the configuration data from a file. Useful when passing to a different computer or managing several stores. Save the configuration to a file. 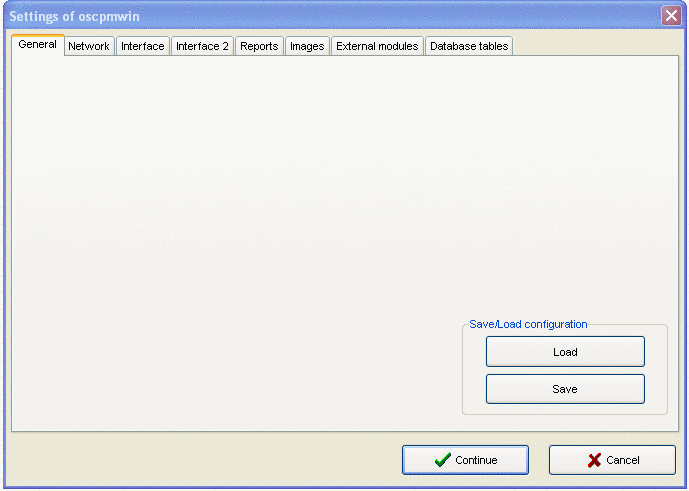 Useful to backup the configuration to use it at different conputers or when managing several stores. This value is used only to calculate the estimated download times. Define the URL of the script used to upload images to the OSCommerce directory. Usually the URL is /catalog/oscpm1_upload.php, but may vary depending on the configuration of OSCommerce. How many milliseconds to wait before failing the connection to the server-side script server or any other web server. How many times to retry a connection to the server-side script server before failing. Define the user name to use for connecting to the database server. Define the password to use for connecting to the database server. If enabled, the database password is stored in the Registry and in the exported configuration files, which is more convenient but more insecure. If disabled, the database password will be asked every time you connect to the OSCommerce server. Store all SQL queries with timestamps to a file. Use it for debugging purposes. Compress network traffic. This is useful when using remote link connections, not in a LAN. If you change this option, you need to disconnect and connect again. 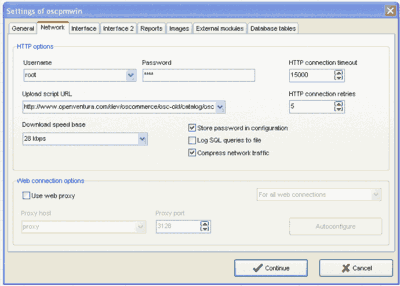 Define the host name or IP number of the proxy server to be used to download the product images. If you don't need a proxy server to browse the web, leave it empty. Define the TCP port number of the web proxy. 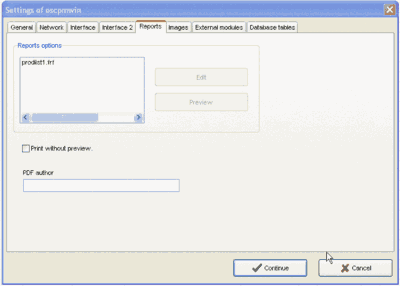 Load the proxy configuration from the system configuration. 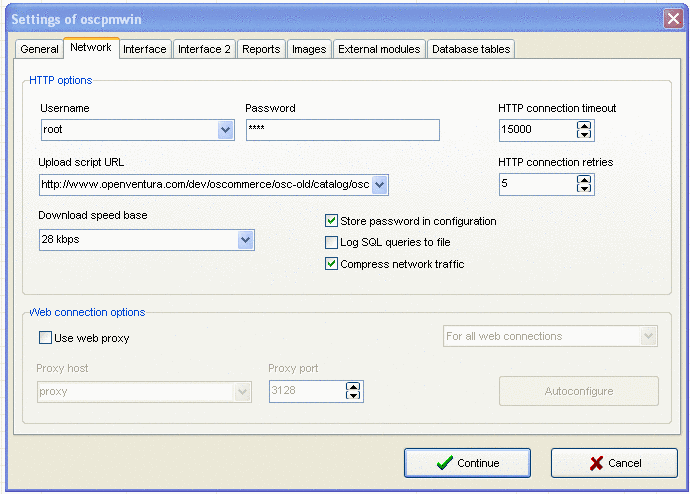 Enables the use of a web proxy. Defines if the proxy settings will be used always, only to contact the server-side script or only when looking for updates. If enabled, the program will start with the same column and window size as the last time you used it. If enabled, the hot track visual effect will be activeted for the category tree and the product listing. If enabled, the list of product will be downloaded for the selected category. This may be a better option for fast network links. If disabled, you will need to double click the category to download the product list. This may be better for slow network links. Enable the drag and drop of products from the product list to the category tree, to move groups of products easily between categories. If enabled, some options will display a tooltip with additional information when the mouse passes over it. 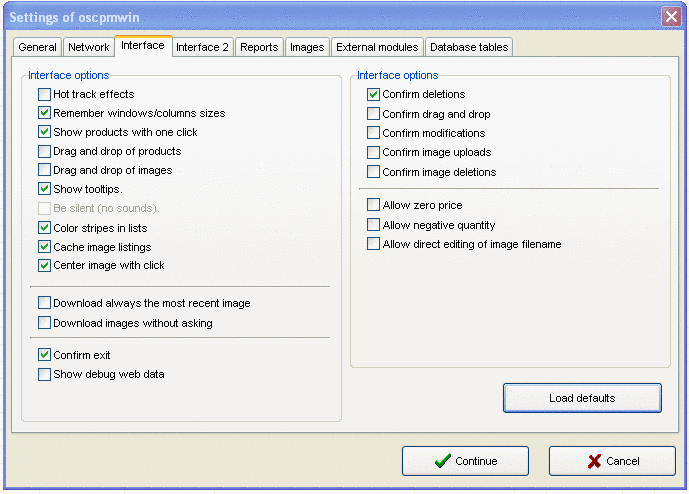 Enable the drag and drop of images from Windows Explorer to the Product Edit window, to select and upload easily the image files of products. When editing a product, download the image automatically. If disabled, the user will need to press a button to start the downloading of the image. This may be a better option for slow network links. If enabled, when downloading the product images, the program will ask the web server/web proxy to provide a fresh version, not a cached one. Enable it if you are getting the same old image even when uploading a new one (this may happen with some web proxies). 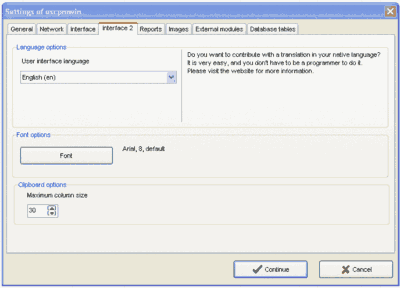 Ask the user to confirm the exiting of the program. Display the answer got from the web server when uploading image files. This is useful only for debugging purposes. If enabled, the rows of some lists will be displayed in alternate colors for easier reading. If enabled, the image filenames and dirnames from the server will be cached, improving the performance of the application when uploading product images. When editing a product with multiple images, the clicked image is centered for easy viewing. However this can make more difficult the selection, uploading and reordering of the images. Ask the user to confirm every deletion operation. Ask the user to confirm every drag and drop operation. Ask the user to confirm every modification attempt. Ask the user to confirm every image upload. 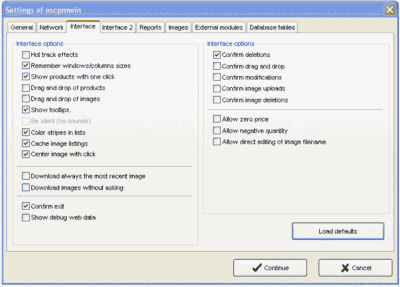 Ask the user to confirm every deletion operation on the product images. If enabled, you can enter zero as a valid price for the products. If enabled, the quantity of a product can be negative. 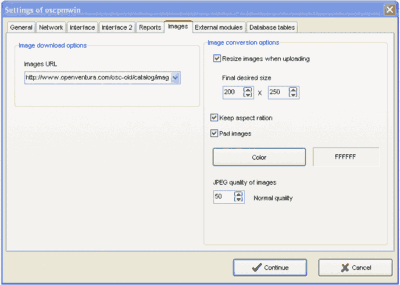 If enabled, the filename of the image can be modified directly, without uploading any file. Reset the user-interface options to the default values. 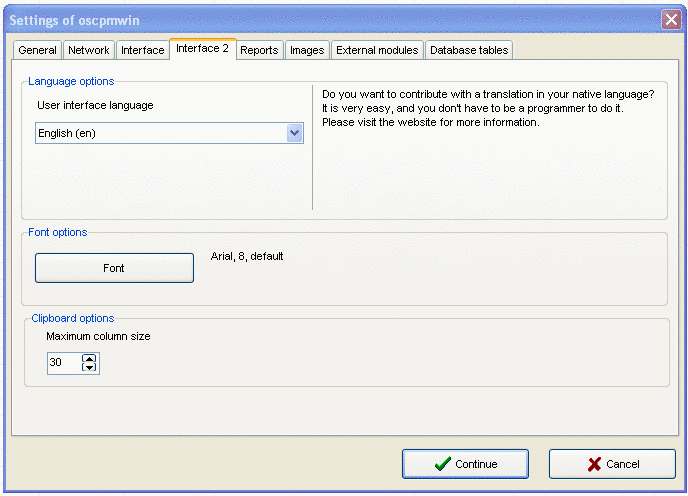 Select the language you want to use for the menus, buttons, and other user interface controls. Define what font to use for the user interface controls. Set the maximum column size allowed when copying to the clipboard in preformated style. Columns wider than this value will be truncated. 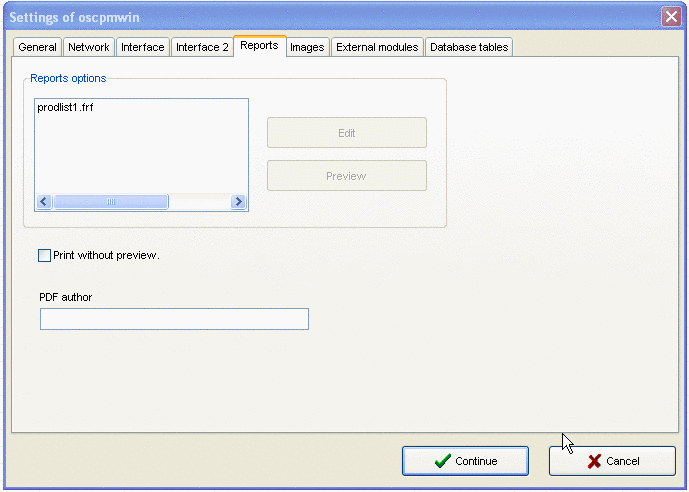 Display the report-editing window to modify the layout and content of the currently selected report. This is the list of available reports. Shows a testing preview of the currently selected report.. If disabled, when requesting a printed report.a preview will be shown first. Otherwise, the report is printed directly to the default printer. The name to set in the Author information of the generated PDFs. If enabled, the images will be resized to thumbnails when uploaded. Enter the quality of the JPEG conversion. The higher the number, the better the quality but the image size will be higher. The lower the number, the smaller the image, but the quality will be worse. Suggested values for OSCommerce are between 40 and 50. Only valid if aspect ratio is preserved. If enabled, resized images will be padded to fill the surrounding empty space with a color. If enabled, the resized images will keep their original aspect-ratio, avoiding distortion. Select the color used to pad the resized images. Define the URL from where the images of products can be downloaded. Usually the directory is /catalog/images, but may vary depending on the configuration of OSCommerce. How many milliseconds to wait before retrying the connection to the external module. How many attempts to do if the connection to the external module fails. This is the list of available modules already configured. Defines the common name used to identify this module. Defines the command line and arguments to be used when invoking the module. If the module is a remote module, it defines the remote IP address. For example, c:\modules\mod.exe param1 param2 param3 param4. Browse to select the executable file to be called when running the module. Parameters to be used when running the module. Define the TCP port to use to connect with the module. Just run the program, do not wait for it to finish. 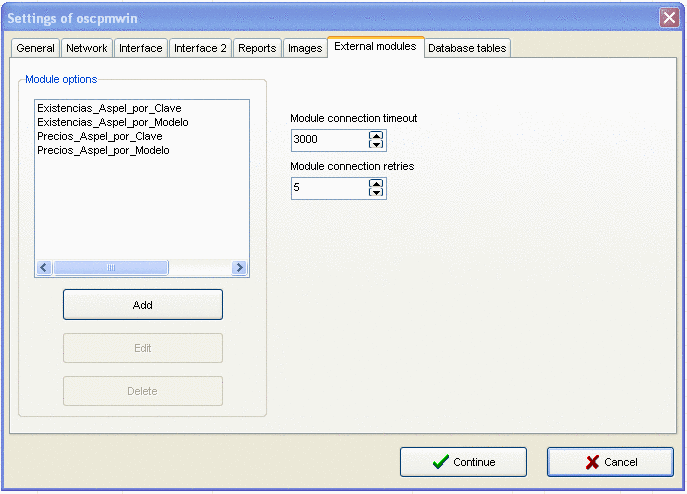 The module is only available if there are selected products records. If enabled, the software will not try to launch a local module but it will try to connect to a module in a remote computer. If this option is enabled, the Command Line-Hostname will be interpreted as an IP address. Defines what field to use as index. 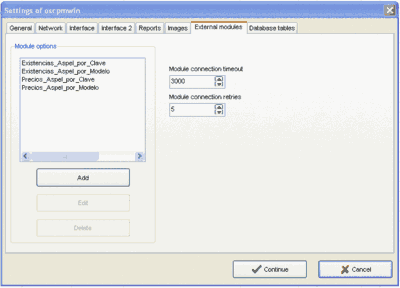 This means: what data will be send to the module to identify the product. Defines what field the resulting data belongs to. This means: what data will return the module. Enter the name of the table categories. Enter the name of the table manufacturers. Enter the name of the table products. Enter the name of the table specials. Enter the name of the table products_description. Enter the name of the table tax_classs. Enter the name of the table currencies. Enter the name of the table configuration. 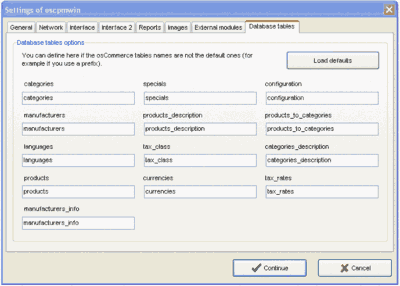 Enter the name of the table products_to_categories. Enter the name of the table categories_description. Enter the name of the table tax_rates. Enter the name of the table manufacturers_info. Reset the table names to the default values.